Wind, water and wide-open beachfront make Sea Island sublimely suited for flying kites of all types. Sunny spring and summer days on the Island encourage families to gather outdoors, where gentle breezes are ready and waiting to lift kites into the open sky. 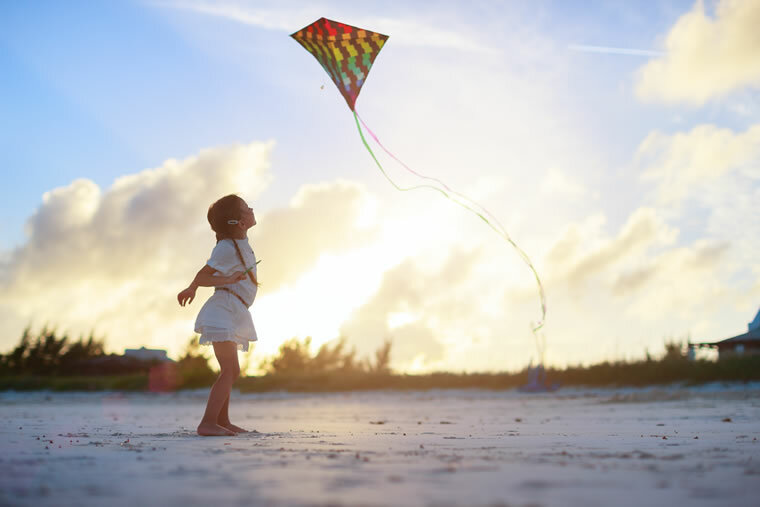 With its picturesque setting, there are numerous opportunities for flying kites of all varieties at Sea Island. Sometimes the choice is to use the most familiar type of kites from childhood—simple, single-line wonders. These colorful contraptions are available from the Sea Island Surf Shop at the Beach Club. Because of the Island’s plentiful trees, the optimum place to launch a kite is the wide-open space of the beach, wind provided. Drop by the Sailing Center to ask staff about tips and pointers on getting a kite launched. Now, members and guests at Sea Island can experience the area in a whole new way thanks to the addition of kiteboarding and stunt kiting to the Beach Club Sailing Center’s offerings. Stunt kites have multiple strings, which provide more control and mobility. Stunt kiting is a great sport for all ages. Instructors teach the basics of kite flying as well as reading a wind window, the area of the sky in which a kite will be able to soar. Stunt kites differ from the familiar one-line kites; two or more lines provide more control and mobility. “The lines give you a way of maneuvering the kite up and down the beach and of doing tricks with it, like making it spin on a single axis and doing inverted maneuvers and box formations,” Earl says. These kites are also much stronger than one-string versions. “You can crash them and they just pop right back up,” he says. Some are made in a weave that incorporates smaller fibers with larger ones to create squares of reinforced fiber that resist tearing. Others are crafted from foil. “There’s not really any permanent structure to the foil ones,” he explains. “The wind is actually the structure.” When not being flown, foil kites crumple into what resembles a bag of clothes. He recalls a recent memorable stunt kiting adventure at Sea Island with a father and his two kids. “The dad was an experienced stunt kite flier, but hadn’t done it in 15 years,” Earl says. That day, “he was like a rock star, zigzagging back and forth. His kids were totally impressed.” That’s the type of experience that makes stunt kiting a family memory in the making. “Watching a father wrap his arms around his kid, helping him hold two lines and teaching him how to fly a kite is really special,” Earl says. 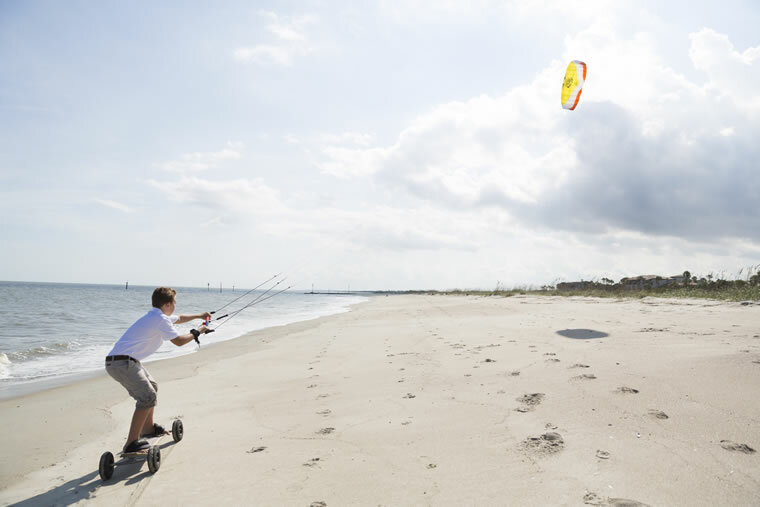 Kite landboarding is a recent addition to the activities at Sea Island. The kite for kiteboarding has roughly an 8-foot wingspan. A wakeboard or skimboard is used to glide across the water. “We do a lot of beach training, learning the wind window,” Earl says. “We’ll go over how to rig up the lines and your safety stops.” How quickly someone grasps kiteboarding concepts varies; only then does the lesson move to the water. 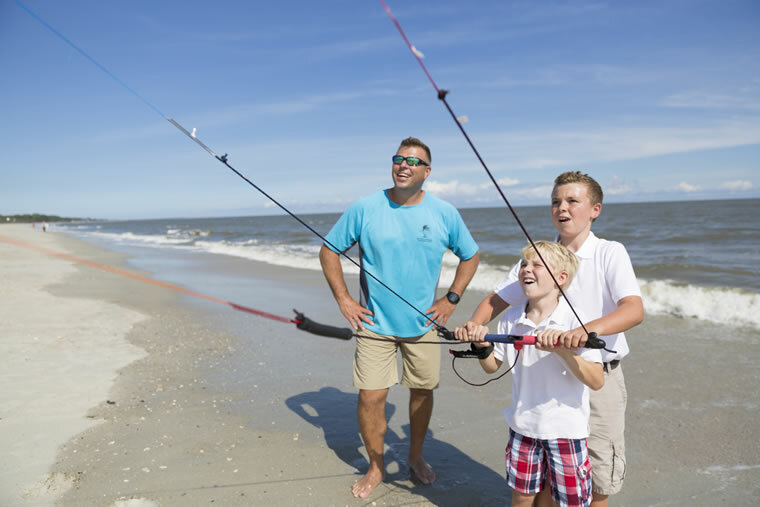 Whether you choose simple single-string kiting, stunt kiting or kiteboarding, Sea Island provides the perfect setting for families to harness the power of wind, and fit everyone’s idea of fun in the sun.